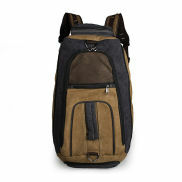 Our selection of backpacks covers both canvas and genuine leather backpacks. If you are looking for a particular model, then use the drop down menus to filter through the various choices. All models are in stock. Trendhim sells leather and canvas backpacks. Canvas backpacks are smaller, lighter and very practical, whereas leather backpacks are for the discerning man who wants something special. All of our leather backpacks are made from 100% genuine cowhide. We mostly use highly treated leathers because of their smooth and uniform appearances as well as the good protection they offer against different weather conditions. Uniquely we sell leather bags that at first glance look like ordinary shoulder bags, but thanks to an extra set of removable shoulder straps, the bags can quickly be converted and carried like backpacks. These models provide you with the versatility required to your changing circumstances. Leather and canvas should not be treated or maintained in the same fashion. Please refer to the cleaning and maintenance advice given below. Canvas is a woven textile fabric made primarily of flax and should be treated the same way as other textile materials. Canvas does not require extra protection from penetrating sprays. Avoid using any kind of chemicals or detergents. Stick to warm water as much as possible. For stains that hot water cannot handle, you can used a little mild detergent mixed with water on a toothbrush to gently brush away the stain. The more processed the leather on the backpack, the less leather care is necessary. Highly treated leather is often smooth and uniform surface wise. Use a good quality penetrating spray as soon as you receive your bag. Avoid all detergents and chemicals. Avoid exposing leather to too much sunlight or excessive heat for long lengths of time. Untreated leather with dry, dull and rough surfaces will look much better after rubbing on some leather fat. Only use approved leather care products for that purpose. A highly desiccated leather backpack can be freshened up with leather and grease after that. 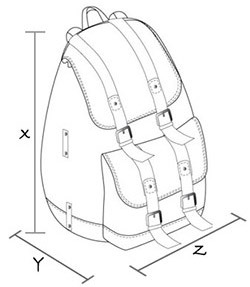 Each backpack shows its measurements under the dimensions heading. They are stated in height (x), depth (y), width (x) and all three are illustrated below. How high or low should my backpack hang? One of the things that you may be wondering about when buying a new backpack, is how far up or down it will hang on your back. There is no right or wrong answer to this question; it is strictly a matter of taste and comfort level. Some say leather should be worn lower than canvas but there are no cut and dried rules. Either way, all of Trendhim backpacks have fully adjustable straps so that you completely decide on the length that suits you best.